Greenpeace slammed the Philippines' "obsession and reliance" on "dirty coal energy" in a report on Wednesday which claims the country stands to lose billions of dollars in economic revenue and a catastrophic toll on humans and the environment if it does not change course. Greenpeace's "True Cost of Coal Volume" report is an overview of how coal has negatively affected the Philippines environmental health, and damaged agriculture and marine life. The report also exposed how government officials and key players in the energy sector "mislead the public, claiming how coal investments will propel the nation to a more energy secure future". "This report should make President Aquino and his energy officials to re-think about approving more coal fired plants, aside from the 45 plants currently in the pipeline," said Reuben Andrew Muni, climate and energy campaigner for Greenpeace. Greenpeace maintains that coal is a "highly polluting energy source and emits much more carbon per unit of energy than oil and natural gas." In the first of three parts, the report focused on the external costs of coal energy production in the Philippines, from mining to importation. Greenpeace research shows that coal is not cheap. A typical new 600 MW coal plant has a price tag of roughly US$2 billion. More than 34 percent of the Philippine's power generation comes from imported coal from Indonesia. Muni said the Philippines is hostage to international fossil fuel markets for the cost of fuel, which can be up to 70 percent of the total generation cost passed on to consumers by the government and power utilities. 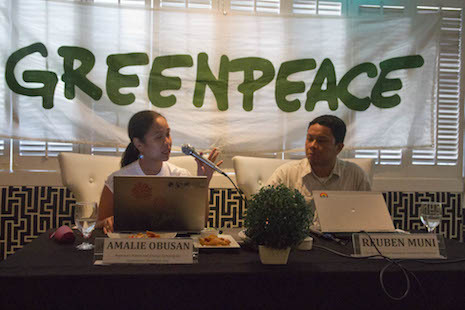 "By constantly spending money to acquire foreign coal, the Philippines is unnecessarily squandering its foreign currency, sending it abroad, which negatively affects its balance of trade, as well as its energy independence," said Amalie Obusan, regional climate and energy campaigner for Greenpeace Southeast Asia. The Greenpeace report also gave insights on how coal powered plants operating in the country have endangered communities and the natural environment. "Coal is not cheap and the human and environmental costs of dirty energy are just too high to ignore. We cannot allow the status quo to continue," said Muni during the press briefing. The report claims that the Philippines can cut its reliance on fossil fuels by as much as 45 percent by 2020, and renewable energy sources can provide 55 percent of the power needs of the country.